It is very important to secure your Google Gmail Account. Today most of the people are using Gmail Account to register with another service. We are very dependent on Gmail so need to secure our Gmail account. With password hacking too easy nowadays, what is the next level of password security? In this article, I have explained How to Secure Your Gmail Account. 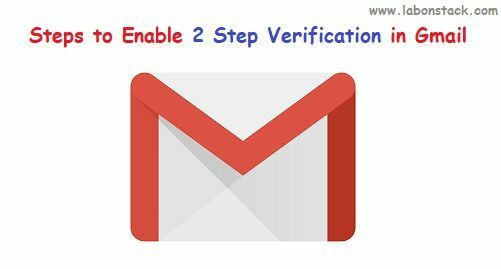 Using 2 Step Verification you can secure your Gmail Account. What is 2 Step Verification in Gmail? This is an additional layer for security that you can add to your Gmail Account. If you enabled it, you need to enter on a special code that is sent to your device or verify a sign in an attempt on your phone. Using 2 Step Verification you can increase the security of your account. It basically means that when you log in, Google will send the user a one-time password (OTP) on their mobile phone (to confirm it is indeed you). Step 1: Go to your Google account and login – Click Here. Step 2: Click Sign-in & security Menu. It’s on the left side of the page. It will allow you to set up all your security features on your account one by one. Or Alternatively, you can directly visit http://accounts.google.com/SmsAuthConfig and check how your 2 step authentication is set up. Step 3: Now Click On “GET STARTED” Button. It’s a blue button in the bottom-right corner of the page. Now you will be redirected to Login Page because you need to Enter your Google account password. This step is to confirm your identity with Google before continuing. Step 4: Enter your phone number. Do so in the text field below the “What phone number do you want to use?” heading. Basically, you need to specify a mobile phone number where you can receive OTP and enter the verification code after the password. You can also opt for voice calls. Step 5: Click Next Button. It’s in the bottom-right corner of the screen. Doing so will prompt Google to send a code to you. Step 6: Click Next Button. Click TURN ON Button. This blue button is at the top of the page. Clicking it will enable two-step verification for your Google account. Now whenever you log into a new device, you’ll be prompted to enter a code delivered to your phone. Do I Use 2 Step Verification in Gmail? I had activated this feature often but getting a One time password (OTP) on my mobile phone at every login was tedious for me. So I deactivated it many times. But this feature is very helpful because now the feature is easier to implement as it allows trusted devices where once you set up 2 Step authentication, it will not keep prompting you for OTP on your everyday computer or mobile Gmail app. How to Forward Gmail Messages to Another Account?